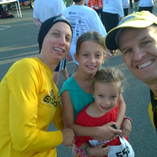 We went to the five k. They said ''get set go.'' I ran but my legs started to hurt. I got to the aid station I could see my dad and sister running on the other side. I talked to a girl 11 years old or 12 years old. I started running but my feet started hurting. I saw mom up a head. I finished the run. We got ready to go. Mommy is at the front. Anna is in the middle and I’m farther back. The race person said go. I was running. I started passing people. Daddy came back from running with Anna and said “Wow, you’re already here!” I was running with him for a while and started getting a side cramp. It was hurting. Daddy said keep going. Finally there was an aid station. I slowed down and got some water. Daddy said, “start going”. I said “it hurts even more”. I started running again. Stopping and going. Daddy said that when we get to the sign we will stop and stretch. When we did, then I started running again. Then I fell I cried. Daddy said, “Do you want to quit the race?”. I said, “No” and then took off. Everyone was saying “Good job, Ariel!” Then I started running and Daddy couldn’t catch me. My side still hurt. I was almost there. Then I saw Mommy standing at the end. I finished the race. I saw Mommy. I got some water. I got pancakes. It was so fun. The four of us wake up early at Nana Sue and Papa Ray’s house. We had a great, late night hanging out with them and Aunt Tracy and cousins, but it did make it hard to get up. Amazingly we still leave on time. We turn on a funny song from “Muppets Most Wanted” (I Can Get You What You Want) and sing our way to the start. Today, the girls are racing and Troy is supporting. Troy will start out with Anna and then finish the rest with Ariel. Once registered and the correct race bibs are on the girls (had to double check to make sure I never make that mistake again! ), I warm up. 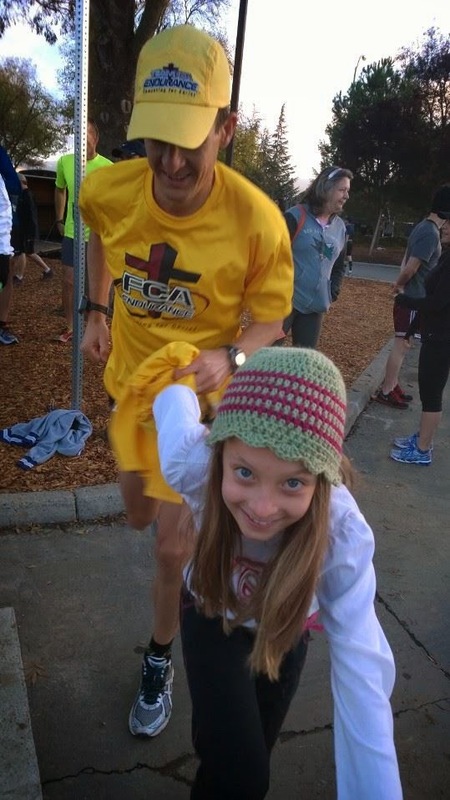 It’s a crisp morning and I’m glad to have on my FCA Endurance long sleeve and beanie! I come back and racers are lining up! We all pray together. It’s important to remember that Christ is first. I give big hugs and kisses and find a place on the starting line. Ready, set, go! The top guys are off the line and seem to be down the road before I know it! Wow! I remind myself that this is going to be tough to go fast…but the good news it will be over soon! I see 3 girls ahead of me and I pull past one of them. The top guys are long gone! Mile 1 is 6:41. Oh boy, that is going to be tough to hold but I’m going to try. I pass the 2nd girl who is wearing turkey legs on her head…cute! I see the top girl ahead and push harder to close the gap. Mile 2 is 6:31. Thank you Lord for that mile! I’m now very close to the top girl. I might be able to win a prize for the family with this being an inaugural year. It’s only going to hurt hopefully less than 7 minutes now! I pass the girl and say “good job”. She’s a young gal…probably still in high school…impressive! I try to go by as fast as I can to make the pass stick and hope my legs and lungs carry me home. Thank you Lord that the hamstrings don’t hurt much and are not holding me back! We are now coming back the way we went out. Like a horse returning to the barn, I want to get this over with! I cannot go faster but I’m just trying to maintain and not blow up. Mile 3 is 6:41. Hang in there! I round the corner and push hard to the finish. Yeah, first girl! Ah, so glad to be done. It’s hard to take off the chips (yes, there is one for each shoe) while being out of breath. I see the young gal finish and hurry to get them off. Finally after a few minutes I’m able to congratulate her. Thank You Lord for this race! Now it’s time to help bring my girls in! Today's marathon is serving as the final leg of my Ironman Tahoe. I was very happy with the swim and bike at Tahoe, but it was too smoky to complete the run. I'm excited about this course in Morgan Hill because it winds around the South Bay reservoirs, very memorable training grounds for me. Most memorable is when Pat Farrance and I ran around these reservoirs training for our first Marathon in 1994. Last night we stayed at the Ridders and were joined by the Jacksons, and re-counted some stories from our many training adventures in the South Bay. 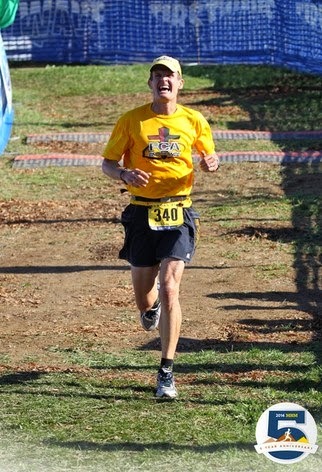 My training leading into today wasn't perfect but I am in better running shape now than I was before Tahoe. Not having to keep up with the bike and swim really helped. Today I'm going to try and maintain good form even when the legs start hurting. I've been working on running faster on longer runs and staying more relaxed and positive. Focusing on the Lord has helped the most. Robin and girls drop me off and find a perfect parking spot near the start. After a good warm-up I stretch and then we pray together. 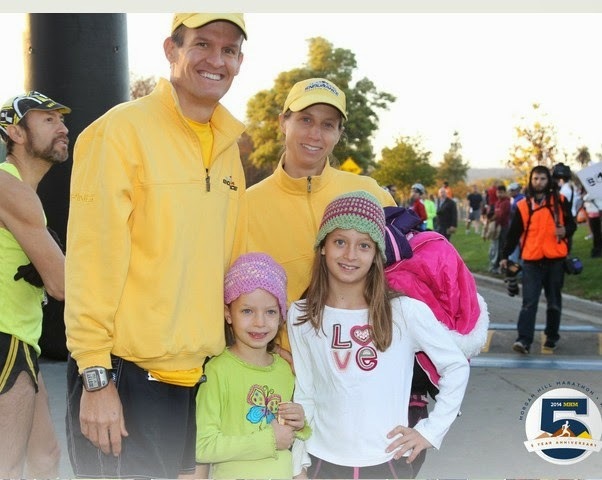 Although the race said 2000 entrants, most of them appear to be in the 5k, ½ marathon or walking division. Go! It's a brisk clear morning. I'm glad I went with the short-sleeve because it looks like it will get warm later. Leaving Morgan Hill and heading towards Watsonville Rd, it's a small pack, about 50, around me. My goal is 7:30 pace for a 3:17 (same time as the last 2 marathons I did, but more difficult with the hilly course today). Mile 1: 7:03. My pace is fast, but there are hills ahead. The ½ marathoners turn right and we turn left, leaving only about 10 ahead of me! This is quite a change from the Napa Marathon in March with hundreds of runners ahead. Mile 2: 7:10. Aid stations at 2mi a part. Mile 3: 7:17. Still pretty flat. Trying to be relaxed as possible. A few guys pass me and I encourage them. One guy has headphones on. A car is coming along Watsonville Rd and I have to yell "Car Back!" for him to hear me and move over. He's running really smooth but I wonder if I'll be able to catch him later on. Mile 4: 7:32. Starting to need 2 cups at aid stations. Mile 5: 7:18. We turn towards Uvas Resevoir and start the rollers. All alone now, but happy to be on these old stomping grounds. Quick nature break. Mile 6: 7:46. According to my Garmin I'm at 7:22 pace, but then according to mile markers, I'm at 7:35 pace! I've got to pick it up and the hills have just started. At the top of the first climb I can see Uvas Resevoir. It's very low. I think of fond memories of Robin's Survivor challenge we had on the island. 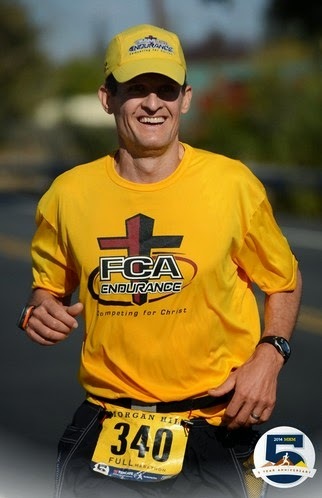 A tall guy (Doug) goes by and says he likes my FCA shirt that says Competing for Christ. I understand that to mean he reveres the Lord as well, and possibly a brother in Christ. I happily encourage him on and also hope that I can catch up to him later and have more chance to talk. Mile 7: 8:06. Not bad for a hill. Mile 8: 7:25. Getting more thirsty. Gatorade and water. Mile 9: 7:21. It's beautiful running along the reservoir and the hillside pastures. Mile 10: 7:48. My legs are getting a little sore but actually feel better than a great 10mi run I did a month ago. That was the run that I first started trying to run without noticing the soreness. 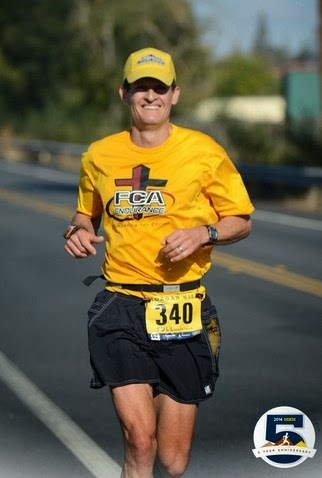 I focussed on the Lord and pretended that each pounding of the road was actually a massage for my legs. Jeff Landauer is great sports masseuse and would shake out and rub out the soreness from my legs. So I pretend the road is doing that. That run was a PR with less soreness at the end. So to have even less soreness now is very encouraging. But I'm still behind pace. Mile 11: 7:25. This is the toughest hill yet, but I'm excited to get it over with. Mile 12: 7:33. Great! 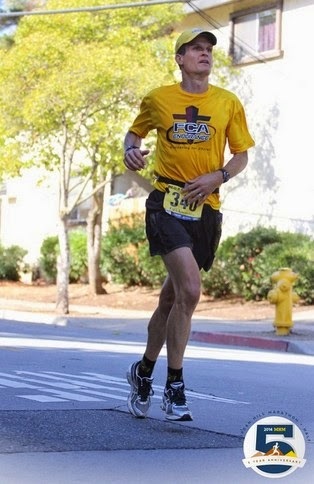 The last 6mi in 7:38 pace. Now downhill for a bit. Another nature break. Aid station at the bottom is very enthusiastic. More water. Hard right turn. Can't wait to get out of these canyons now. Off-camber roads increase the soreness, but I try to ignore it. Run strong, with a smile. Mile 13: 7:00 That downhill helped me get closer to pace, but not enough. Mile 14: 7:25. I remember riding this road with Robin in training. The off-camber is tough. I'm pushing harder now. I hear a large aid station ahead. I wonder if Robin and the girls will be there! I wave and smile to the spectators.. but no family yet. Mile 15: 7:43. Now for the last big hill before descending into the valley for the last 6 flat miles. I'm breathing hard. If I can keep the pressure on, I will hopefully catch back up to my pace on the big descent. At the top! The last 3 miles were 7:32 pace. Good job. Thank you Lord. But the descent is the most painful part of this race so far. It's a steep grade. Each pounding landing sends shocks through my sore legs. But I ignore it best I can. A woman ahead is also flying down making up time. Mile 16: 7:25 I catch the woman at the bottom and head towards Santa Teresa Blvd. There's my family! The girls have made posters and Robin's got the camera. I'm so glad to see them. I tell them I'm about a minute off my pace but will make it up soon. It's getting quite hot now and I chug 2 cups at the aid station. Mile 17: 7:06. Still a minute behind. If I keep the pressure on a couple more miles maybe I'll catch up and be able to ease up. Mile 18: 7:33. Still a minute behind. Even with pushing harder to catch up, I'm actually only maintaining pace. This is going to be harder than I thought. Up ahead I see the tall guy in yellow. Robin and the girls go buy and I tell them to cheer for him and that he might be a Christian, too. Mile 19: 7:24 After pushing hard for 3 miles, I'm still a minute behind. Mile 20: 7:26. I see the lead man coming back. He looks like a Kenyan. And the female pro is not that far behind him. I notice them running by the 23 mile mark and I long to get to the that marker. Over the freeway to the big loop. Mile 21: 7:39. Running in the wind has been hard. I passed a guy and another guy passed me. Mile 23: 7:25 Yay! I smile and thank the Lord. When I was here going out it seemed so distant. Mile 24: 7:32. My family gives me one more big cheer. They seem to be having so much fun. 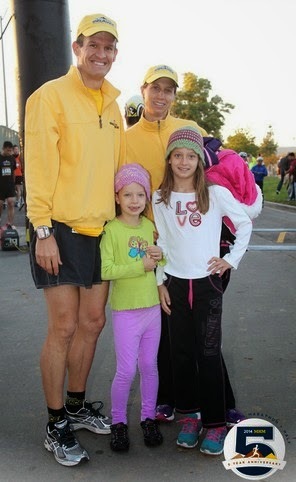 They tell me I've gained on the tall guy in yellow. Part of me has wanted him to weaken and slow down so I could catch him but instead I've actually been praying for him to feel good and maintain. Now I'm catching up to him. I find out his name is Doug. 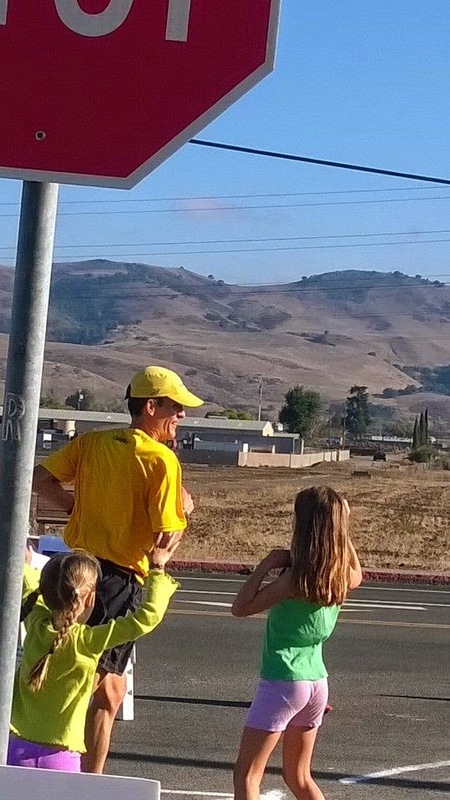 He heard my family cheering for me and tells me he has a 6 yr old daughter that's waiting for him at the finish and he has to stay strong in order to run with her. I say a pray out loud for him and I to get strength and run well to the end. We both hurt, but we both want to overcome it and know we gave it our all. Mile 25: 7:56 I pulled ahead of my friend, Doug, on that gradual climb. I was hoping so much that the mile markers were wrong all along and that I would see the finish only a ½ mile ahead. But instead see more mile markers. I think, "really, we're going to run the whole 26.2 miles according to the markers?" Of course, I'm surprised I even though that. A final slight downhill pounding. 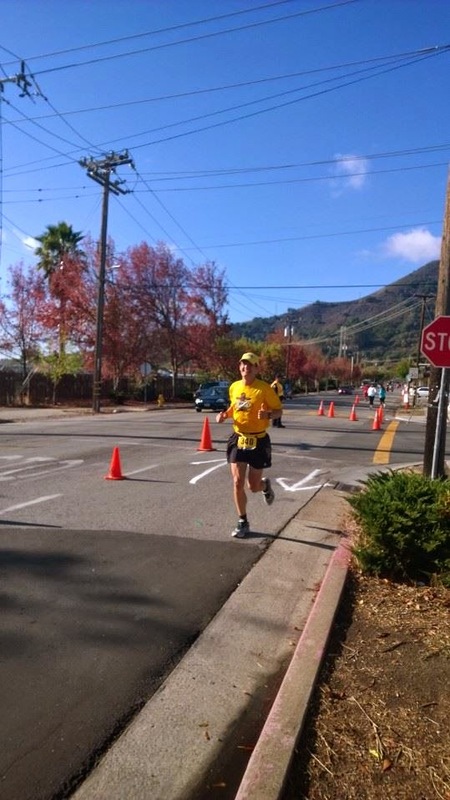 My legs hurt but not nearly as bad as my Napa marathon in March. There I ran 6 miles with cramps and strained muscles. Thank you, Lord, for giving me such a different experience, and keeping my legs from giving out on me. Mile 26: 7:23. Ah, the finish line! The run was much less painful, but afterwards it feels just as painful. At least I can lie down and wait for it to go away.. and appreciate what a wonderful family I have to support me so enthusiastically. I was a minute over, but it was a very successful race! Thank you, Lord. 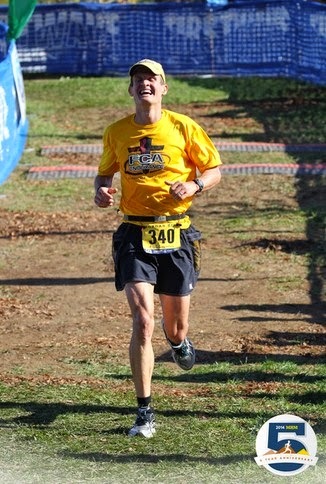 Finish: 3:18:04, 2nd / 120, 12th overall.